Please write “RYAN FINKE” on the check memo line or in the memo or account field in your online bill payer. As the Communications Director, Ryan manages a team of graphic designers, copy editors, video producers and social media managers to tell the stories of how God is working among international students. His team produces flyers for events, monthly newsletters, website updates, and videos to improve communication between IFI and donors, volunteers, and students. Their goal is to bring more honor to God. Ryan became involved in international student ministry while in college at the University of Cincinnati (UC). Since first feeling the Lord’s calling to continue serving international students, Ryan studied Mandarin in Beijing, China, for four months, helped start an international Bible study and American slang class on the UC campus, and married an amazing woman who also has a heart to serve internationals. 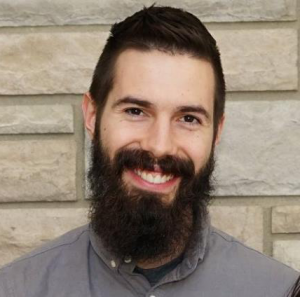 Ryan studied Graphic Communication Design at UC’s design college and has been practicing web design, web development, and video production since before high school. After starting his first web design business as a sophomore in high school, Ryan worked for web startups located in San Diego, London (UK) and Cincinnati to pay his way through college. Since he first knew God, Ryan felt drawn to serve Him passionately. In 2015, Ryan and his wife, Liz, learned of the opportunity to join IFI’s staff as Communications Director. It was the perfect mix: Using God’s gifts of design and communication to serve international students full time, and requiring larger faith to leave his web design job and raise financial support instead. After seeking to understand how to best honor God, Ryan and Liz decided to move forward together in faith, excited for what lay ahead. Support Needs: Ryan is striving to continue serving with IFI long-term and dedicate the gifts God has given him to serve internationals. To do so, he is looking for monthly financial supporters to join him and his family in fulfilling God’s promise to bless all nations.